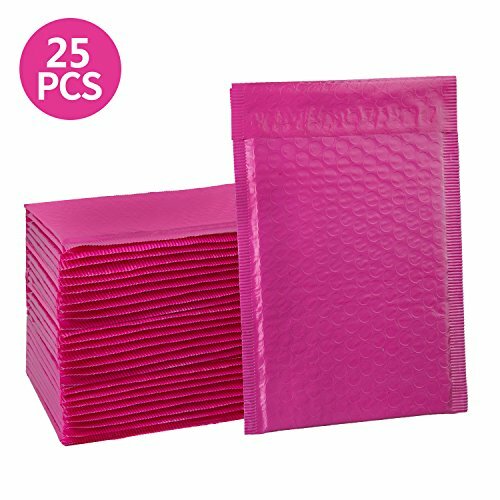 LIGHT WEIGHT MAILERS - This pack of 25 6x10 inch padded envelopes is made from heavy duty 100% virgin plastic, are with fashionable design. And those padded mailers are lightweight mailing envelops, will not add to your shipping cost. CUSHION MAILERS - These mailer envelopes are lined with 80gsm bubble, with unique air cellular layers and 360 strong air bubble technology helping absorb shock during shipment.These can provide effective shipping protection for your products. 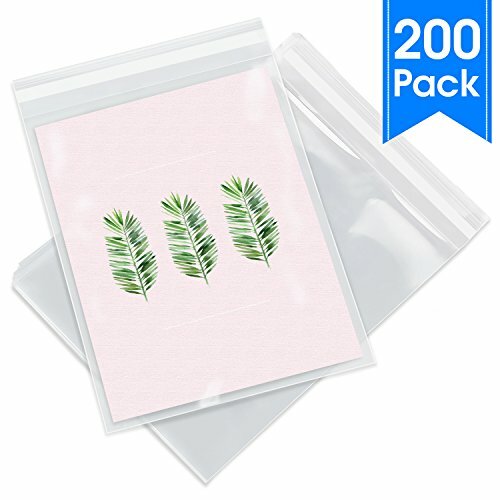 SELF SEALED ENVELOPES - These bubble mailers come with a self-adhesive tamperproof seal.The adhesive on the fold-over flap is strong enough and goes end-to-end.There's no need reinforcement tape and it doesn't come apart unless you tear it up.Peel and stick lip provides a secure, tamper evident closure. MULTIPURPOSE ENVELOPES - These envelopes can be used in offices, at home, in shops, schools and everywhere where there is a need for shipping. And the bubble envelopes feel nice to the touch and are perfect for handwriting, labeling and stamping. 100% SATISFACTION GUARANTEED - All HBlife bubble mailers come with our friendly customer service,We will replace or return money if you are not satisfied with our products. Our 5x7 self seal Cello bags are made to be just a tiny bit larger to fit 5 Inch by 7 inch prints, photographs, prints , and many more. These are crystal clear cellophane bags that are significantly more clear than clear poly bags. The self adhesive feature work very well for packaging a variety of different merchandise. The resealable cellophane bag is perfect for cards, cookies, candy, cards, and invitations . The glossy ultra clear bag feature will make the products have a professional and chic presentation. Our 5x7 clear cellophane bags has a really sticky and reliable seal - significantly better than other plastic bags on the market. The cellophane envelope sleeves work extremely well to fit artwork , photos, and prints. To self seal and adhesive the clear cello bags will allow the products and merchandise to be packaged very quickly. Specifications: 5" X 7" Usable Dimension (Excludes Glue Flap). 1.3 Mil Thickness. 200 Units. Our 5x7 Cellophane bags will fit your 5 X 7 Inch prints, photos, A2 A4 A6 Cards & Envelopes. Our Clear Cello bags are extremely easy to self seal and the adhesive is easily resealable. GREAT PRESENTATION: Our Cello bags are ultra clear, shiny, and are perfect for those who are trying to showcase their creations without bland and plain old flat poly bags or reclosable zip bags. Make your party favors, wedding favors, cards photos, postcards and prints look extra lovely with our crystal clear 5X7 plastic bags. By using our clear favor bags, you can make sure that your small gifts stand out to your guests. FOOD GRADE SAFE: All Pack It Chic Cello Bags are made from premium grade, virgin material, which assures a durable, non toxic, odorless sleeve that is perfect for packaging candy, treats, bakery goodies, and cookies. Our 100% Food Grade safe clear 5X7 resealable bags are perfect as candy bags, cookie bags, goody bags, bakery bags and other food packaging clear bags. EFFICIENT APPLICATION: The self sealing adhesive guarantees a hassle free, easy peel & stick application for your gift and treat bags. Our flexible and resealable adhesive, not only protects your goodies from dust, dirt and moisture, but also provides an easy unwrapping process for your customers or loved ones. Because our 5X7 clear bags are sealable within seconds, it is perfect for companies and sellers who are selling merchandise like handmade goods, jewelry, and soaps. Pack It Chic, a registered brand, is only sold by ATZ Premium Brands. ATZ Premium Brands, a family-owned small business, is distributor of all types of premium quality retail, shipping, and packaging supplies. Pack It Chic carries tons of modern, unique poly mailer envelopes and other retail packaging products to provide countless ways to stand out to your clients. Our Spartan Industrial cellophane bags are 1.5 Mil thick and thus perfect for packaging all types of merchandise and products. Not only do our bags give a very premium feel to your merchandise, but the cello bags are also very easy to package and use. The self-seal feature allows a very quick and easy way to seal the bag. The 9 X 12 cello bags are perfect as t shirt bags or for packaging clothes and garments. The resealable clear bags are also perfect for documents and prints that need an elegant clear envelope. The 9x12 clear cellophane bags work wonderfully for all packaging purposes. SPECIFICATIONS: 9" Width X 12" Length (Length excludes the Glue Flap). 1.5 Mil Thickness. 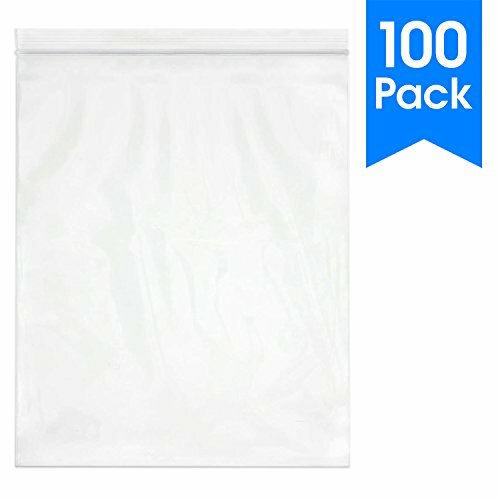 200 Units of the Clear 9X12 Cellophane Bags with Self Seal Adhesive. Our Self Sealing Cello Bags are completely Resealable and Crystal Clear. CRYSTAL CLEAR: Manufactured with premium-grade, virgin polypropylene, our cellophane style bags are extra clear and glossy. 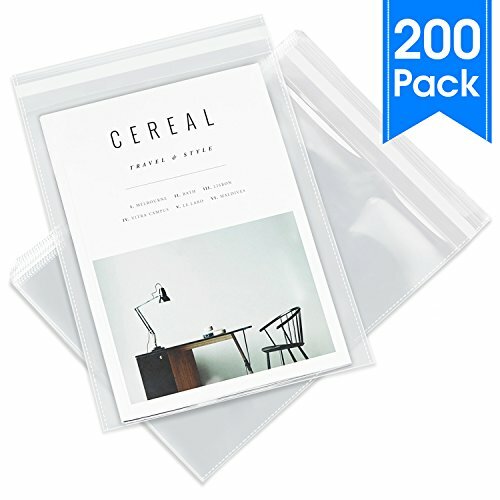 The clear resealable bags provide a very professional vibe and are perfect for packaging artwork, business catalogs, documents, prints and other marketing materials. Our crystal clear sleeves really add a premium vibe and are great for making gifts, favors, and photos more presentable. DURABLE & EASY SEAL: Our 9X12 Cello Bags are made to be 1.5 Mil thick and very durable. Moreover, with our easy seal feature, our clear envelope bags are able to be securely sealed within seconds - simply just peel and seal. Save tons of time with these resealable plastic bags. These 9 X 12 cello bags are perfect for shipping, mailing, and retail purposes. Protect your merchandise significantly more versus regular flat poly bags and flap lock polybags. PERFECT FOR PACKAGING CLOTHES: Our 9 X 12 cellophane bags give a very elegant look to any merchandise and are perfect as apparel bags. 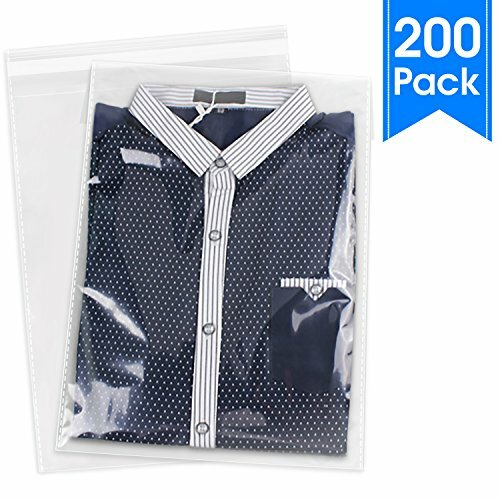 The self-seal clear plastic bags give packaged clothing a classy look and are great for packaging clothes, tshirts, and garments. Sealable within seconds, these shirt bags are perfect for online sellers on Etsy and Amazon. Spartan Industrial, a registered brand, is only sold by ATZ Premium Brands. ATZ Premium Brands, a family-owned business, is a leading distributor of all types of premium quality shipping, packaging, retail and warehouse supplies in North America. Our 6x9 self seal Cello bags are made to be just a tiny bit larger to fit 6 Inch by 9 inch prints, photographs, prints , and many more. These are crystal clear cellophane bags that are significantly more clear than clear poly bags. The self adhesive feature work very well for packaging a variety of different merchandise. The resealable cellophane bag is perfect for cards, cookies, candy, cards, and invitations . The glossy ultra clear bag feature will make the products have a professional and chic presentation. Our 6x9 clear cellophane bags has a really sticky and reliable seal - significantly better than other plastic bags on the market. The cellophane envelope sleeves work extremely well to fit artwork , photos, and prints. To self seal and adhesive the clear cello bags will allow the products and merchandise to be packaged very quickly. Specifications: 6" X 9" Usable Dimension (Excludes Glue Flap). 1.2 Mil Thickness. 200 Units. Our 6X9 Cellophane bags will fit your 6 X 9 Inch prints, photos, A7 A8 A9 Cards & Envelopes. Our Clear Cello bags are extremely easy to self seal and the adhesive is easily resealable. GREAT PRESENTATION: Our Cello bags are ultra clear, shiny, and are perfect for those who are trying to showcase their creations. Make your party favors, wedding favors, cards photos, and prints look extra lovely with our crystal clear 6X9 plastic bags. 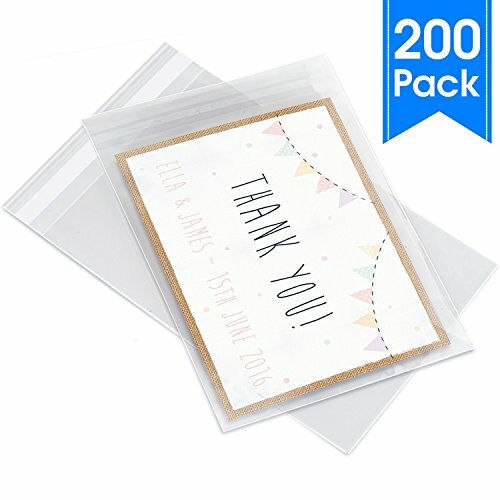 Our 6 X 9 Cellophane bags will fit your A7 A8 A9 cards and envelopes for the perfect thank you card or invitation. Add our clear cello bags to your marketing materials to give your postcards, half letter flyers, and mail a premium feel. FOOD GRADE SAFE: All Pack It Chic Cello Bags are made from premium grade, virgin material, which assures a durable, non toxic, odorless sleeve that is perfect for packaging candy, treats, bakery goodies, and cookies. Our 100% Food Grade safe clear 6X9 resealable bags are perfect as candy bags, cookie bags, goody bags, bakery bags and other food packaging clear bags. EFFICIENT APPLICATION: The self sealing adhesive guarantees a hassle free, easy peel & stick application for your gift and treat bags. Our flexible and resealable adhesive, not only protects your goodies from dust, dirt and moisture, but also provides an easy unwrapping process for your customers or loved ones. Because our 6X9 clear bags are sealable within seconds, it is perfect for companies and sellers who are selling merchandise like handmade goods, jewelry, and soaps. Our 4x6 self seal Cello bags are made to be just a tiny bit larger to fit 4 Inch by 6 inch prints, photographs, prints , and many more. These are crystal clear cellophane bags that are significantly more clear than clear poly bags. The self adhesive feature work very well for packaging a variety of different merchandise. The resealable cellophane bag is perfect for cards, cookies, candy, cards, and invitations . The glossy ultra clear bag feature will make the products have a professional and chic presentation. Our 4x6 clear cellophane bags has a really sticky and reliable seal - significantly better than other plastic bags on the market. The cellophane envelope sleeves work extremely well to fit artwork , photos, and prints. To self seal and adhesive the clear cello bags will allow the products and merchandise to be packaged very quickly. Specifications: 4" X 6" Usable Dimension (Excludes Glue Flap). 1.3 Mil Thickness. 200 Units. Our 4x6 Cellophane bags will fit your 4 x 6 Inch prints, photos, A1 Cards Envelopes. Our Clear Cello bags are extremely easy to self seal and the adhesive is easily resealable. GREAT PRESENTATION: Our Cello bags are ultra clear, shiny, and are perfect for those who are trying to showcase their creations without bland and plain old flat poly bags or reclosable zip bags. Make your party favors, wedding favors, cards photos, postcards and prints look extra lovely with our crystal clear 4X6 plastic bags. By using our clear favor bags, you can make sure that your small gifts stand out to your guests. FOOD GRADE SAFE: All Pack It Chic Cello Bags are made from premium grade, virgin material, which assures a durable, non toxic, odorless sleeve that is perfect for packaging candy, treats, bakery goodies, and cookies. Our 100% Food Grade safe clear 4X6 resealable bags are perfect as candy bags, cookie bags, goody bags, bakery bags and other food packaging clear bags. EFFICIENT APPLICATION: The self sealing adhesive guarantees a hassle free, easy peel & stick application for your gift and treat bags. Our flexible and resealable adhesive, not only protects your goodies from dust, dirt and moisture, but also provides an easy unwrapping process for your customers or loved ones. Because our 4X6 clear bags are sealable within seconds, it is perfect for companies and sellers who are selling merchandise like handmade goods, jewelry, and soaps. Our 8x10 self seal Cello bags are made to be just a tiny bit larger to fit 8 Inch by 10 inch prints, photographs, prints , and many more. These are crystal clear cellophane bags that are significantly more clear than clear poly bags. The self adhesive feature work very well for packaging a variety of different merchandise. The resealable cellophane bag is perfect for cards, cookies, candy, cards, and invitations . The glossy ultra clear bag feature will make the products have a professional and chic presentation. Our 8x10 clear cellophane bags has a really sticky and reliable seal - significantly better than other plastic bags on the market. The cellophane envelope sleeves work extremely well to fit artwork , photos, and prints. To self seal and adhesive the clear cello bags will allow the products and merchandise to be packaged very quickly. Specifications: 8" X 10" Usable Dimension (Excludes Glue Flap). 1.4 Mil Thickness. 200 Units. Our 8X10 Cellophane bags will fit your 8 X 10 Inch prints, photos, A10 Cards & Envelopes. 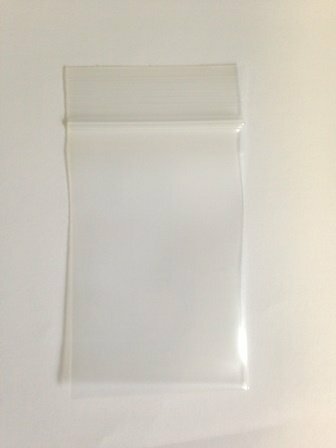 Our Clear Cello bags are extremely easy to self seal and the adhesive is easily resealable. GREAT PRESENTATION: Our Cello bags are ultra clear, shiny, and are perfect for those who are trying to showcase their marketing materials. Make your prints, photos, look extra lovely with our crystal clear 8X10 plastic bags. Our 8 X 10 Cellophane bags will fit your A10 cards envelopes. Add our clear cello bags to your marketing materials to give your postcards, flyers, and mail a premium feel. PREMIUM QUALITY & FOOD SAFE: All Pack It Chic Cello Bags are made from premium grade, virgin material, which assures a durable, non toxic, odorless sleeve that is suitable for packaging and shipping all types of merchandise. Our clear resealable bags are 100% Food Grade Safe. EFFICIENT APPLICATION: The self sealing adhesive guarantees a hassle free, easy peel & stick application for your cellophane bags. Because our 8X10 clear bags are sealable within seconds, they are perfect for usage as packaging bags. Our flexible and resealable adhesive, not only protects your merchandise from dust, dirt and moisture, but also provides an easy unwrapping process for your customers or loved ones. 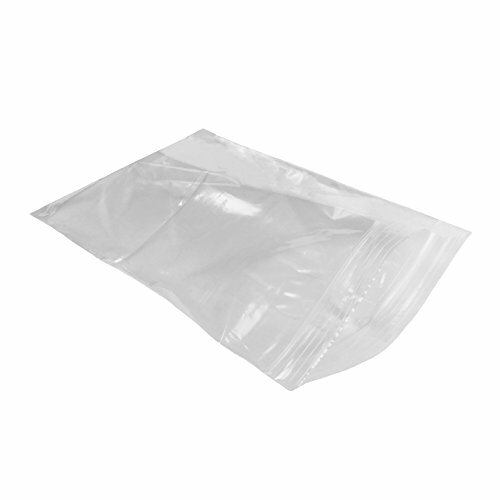 The 4 X 6 reclosable poly bags are perfect to use for packaging or packing merchandise as well. 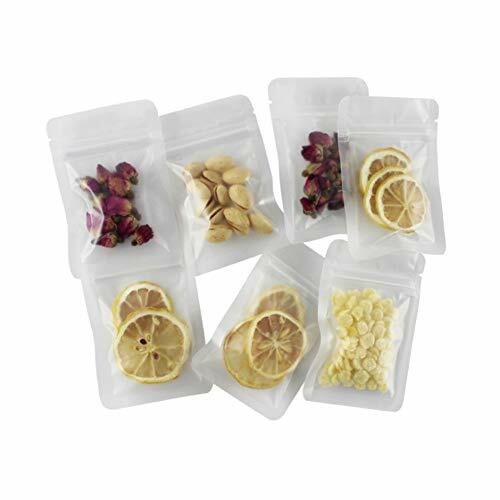 The 4x6 zip bags can be used for herbs, small parts, shipping, handmade goods, soaps, and cards . The reclosable clear poly bags have a really reliable zipper. The seal is strong and the lock is secure. Using these resealable bags not only will save you time but also money! The plastic bag is made of high quality LDPE - it is pliable and incredibly easy to use. SPECIFICATION: 4" Width X 6" Length (Length excludes the zipper ). 2.0 Mil Thickness. 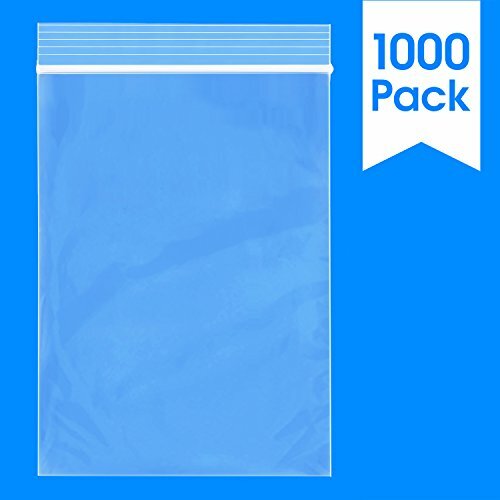 1000 Units of the Clear Reclosable Bags with the Zip to Seal feature. Our Sealable zippers are incredibly easy to self seal and yet, are super secure. WIDE RANGE OF USES: Great for a variety of usages such as storage, organization, mailing and packaging. Our 4X6 reclosable zip bags are perfect for jewelry, beads, sewing supplies and other small parts. The mini zip bags are made with premium-grade, virgin LDPE plastic, which means that our clear plastic bags are durable and able to withstand the unpredictable shipping process. WATERPROOF AND AIRTIGHT: Quality you can see and feel - our zip bags are completely airtight and waterproof. Designed to keep moisture out and to be leak-proof, the 4 X 6 poly bags are perfect for herbs and pills. Our reclosable plastic bags eliminate the need for impulse sealers or tape, and are significantly more reliable than resealable cellophane cello bags, flap lock polybags, or regular flat poly bags. FOOD GRADE SAFE: Our resealable zip bags are made to be durable, odorless, and non toxic. The 4X6 small baggies are perfect for protecting your homemade baked cookies, small treats and candy from dust, dirt, and moisture. Because the reclosable zip bags are so easy to seal and are waterproof, they are perfect for handmade soaps, bath salts and samples. We UCGOU is the professional manufacturer specializing in producing all sorts of poly mailers and bubble mailers. Sustainable innovation is our unremitting pursuit. Having advanced technology and equipment, we are dedicated to offering packaging and shipping solutions to our customers with competitive price, excellent products and service. Lined with 80gsm bubble, UCGOU padded envelopes are made of heavy duty 100% virgin plastic, which have a good stretch, lightweight and water-resistant, not the cheap ones that are poorly padded or have glue everywhere. They seal well and the padding is sufficient. The bubble mailer envelopes provid more protection during transit as compared to basic poly mailers and don't add too much bulk, as a result the shipping is so much cheaper than the complicated larger packages. Tape, wrapping film and corrugated cardboard box......This is too much trouble when you prepare to ship items. It's time to say bye to the troublesome!! Come to UCGOU! Send your package in clean, simple but grand style which would help to upgrade your company professional image. Believe us. High-efficiency mailers with bright and pure color will allow customers to easily identify their orders from your shop when they arrive in their mail. DIMENSION. 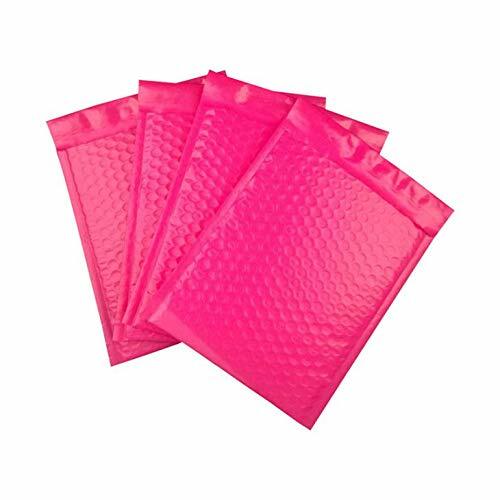 6x10 inch padded envelopes(usable size-6x9"), with opaque pink poly film. 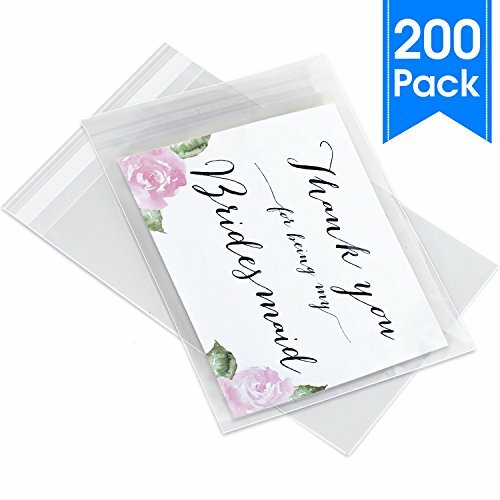 The bubble envelopes feel nice to the touch and are perfect for labeling, stamping and handwriting (Please Use Oil Based Paint Marker pens.Don't Use Whiteboard Marker Pens . COST-EFFECTIVE BUBBLE MAILERS. The padded envelopes are lightweight and water-resistant. Lower the shipping cost of your business and protect your products on the rainy or snowy day. SELF SEALED ENVELOPES. The adhesive on the fold-over flap is strong enough and goes end-to-end. There's no need reinforcement tape and it doesn't come apart unless you tear it up. CUSHION MAILERS. These are pink mailer envelopes lined with 80gsm bubble. The padding is sufficient to mail the items that needed protection. Keep your products safety and make your customer no complaint. MAIL STUFF. The envelopes are strong and you could mail CD, viedo games and movies (within the usable size of 6x9). The quality of the mailer will hold up them in shipping well. Our 10x13 self seal Cello bags are made to be just a tiny bit larger to fit 10 Inch by 13 Inch prints, photographs, apparel, and many more. These are crystal clear cellophane bags that are significantly more clear than clear poly bags. The self adhesive feature work very well for packaging a variety of different merchandise. The resealable cellophane bag is perfect for packaging garments, clothes, tshirts, shirts, and t shirts bags. The glossy ultra clear bag feature will make the products have a professional and chic presentation. Our 10x13 clear cellophane bags has a really sticky and reliable seal - significantly better than other plastic bags on the market. The cellophane envelope sleeves work extremely well to fit 10 x 10 artwork , photos, and prints. To self seal and adhesive the clear cello bags will allow the products and merchandise to be packaged very quickly. Specifications: 10" X 13" Usable Dimension (Excludes Glue Flap). 1.4 Mil Thickness. 200 Units. Our 10X13 Cellophane bags will fit your letter size documents, brochures, and magazines. Our Clear Cello bags are extremely easy to self seal and the adhesive is easily resealable. GREAT PRESENTATION: Our Cello bags are ultra clear, shiny, and are perfect for those who are trying to showcase their creations without bland and plain old flat poly bags or reclosable zip bags. Add our clear cello bags to your flyers and catalogs to give your marketing materials a premium feel. Our 10X13 Cello bags are perfect for 8.5X11 letter size and A4 size documents and prints. EFFICIENT APPLICATION: The self sealing adhesive guarantees an easy peel & stick application for your cellophane bags. Our 10 X 13 cello bags are the perfect size for usage as apparel bags. Our resealable adhesive, not only protects your clothes from dust, dirt and moisture, but also provides an easy unwrapping process for your customers. 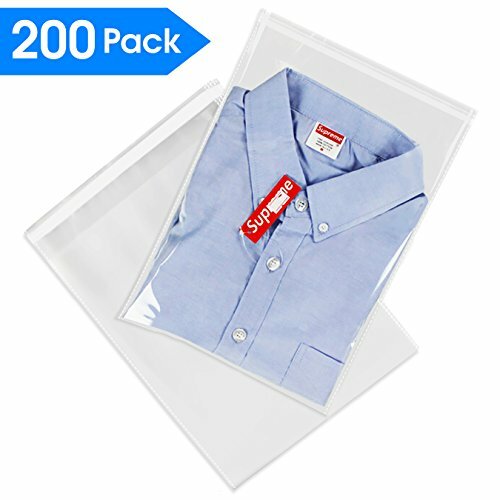 Because our 10X13 clear bags are sealable within seconds, it is perfect for companies and sellers who are packaging clothes, shirts, garments, and t-shirts. Our 9x12 self seal Cello bags are made to be just a tiny bit larger to fit 9 Inch by 12 inch prints, photographs, prints , and many more. 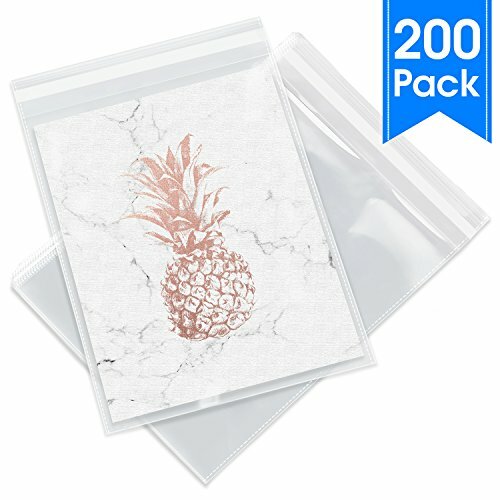 These are crystal clear cellophane bags that are significantly more clear than clear poly bags. The self adhesive feature work very well for packaging a variety of different merchandise. The resealable cellophane bag is perfect for cards, cookies, candy, cards, and invitations . The glossy ultra clear bag feature will make the products have a professional and chic presentation. Our 9x12 clear cellophane bags has a really sticky and reliable seal - significantly better than other plastic bags on the market. The cellophane envelope sleeves work extremely well to fit artwork , photos, and prints. To self seal and adhesive the clear cello bags will allow the products and merchandise to be packaged very quickly. Specifications: 9" X 12" Usable Dimension (Excludes Glue Flap). 1.4 Mil Thickness. 200 Units. Our 9X12 Cellophane bags will fit your letter size documents, brochures, and magazines. Our Clear Cello bags are extremely easy to self seal and the adhesive is easily resealable. GREAT PRESENTATION: Our Cello bags are ultra clear, shiny, and are perfect for those who are trying to showcase their creations without bland and plain old flat poly bags or reclosable zip bags. Add our clear cello bags to your flyers and catalogs to give your marketing materials a premium feel. Our 9X12 Cello bags are perfect for 8.5X11 letter size and A4 size documents and prints. EFFICIENT APPLICATION: The self sealing adhesive guarantees an easy peel & stick application for your cellophane bags. Our 9 X 12 cello bags are the perfect size for usage as apparel bags. Our resealable adhesive, not only protects your clothes from dust, dirt and moisture, but also provides an easy unwrapping process for your customers. Because our 9X12 clear bags are sealable within seconds, it is perfect for companies and sellers who are packaging clothes, shirts, garments, and t-shirts. FU GLOBAL Padded Envelopes #000 50pcs Specifications: Usable space of this bubble mailer envelopes: 4 7 inch. Package: 50pcs/bag Color: Pink & White. Our mailers feature and exterior that is designed to resist the ravages that travel forces upon them. Our poly mailers feature a thick lining of air filled bubbles in order to provide the best possible protection to the items that you ship.The surface is extra smooth, designed to accommodate handwriting, stamping, and even labeling. Simply write the destination address and slip your item into the mailer. Feel confident knowing that the airy bubble wall will protect the items you're sending. Light Weight Mailers: Useful Space: 4x7 inches, pack of 50 lined mailers. Fuxury poly bubble mailers are with fashionable design, stands out of the crowd in the mailer world. And those padded mailers are lightweight mailing envelops, will not add to your shipping costs. Multilayered Construction:The Fuxury bubble mailers are made with multilayered polyethylene sheets. There are several layers of poly sheets heat bonded together to form the Air Cellular bubble layers that are sandwiched between smooth layers. 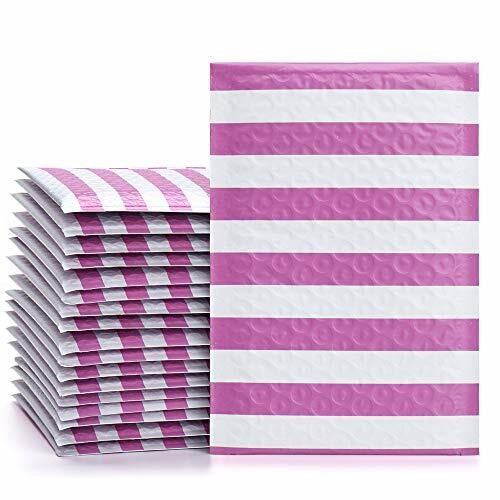 Self-Adhering Envelopes: The Pink Stripe poly bubble mailers come with a self-adhesive tamperproof seal. They provides a reliable, tamper-evident tight seal to secure all enclosures. It cannot be opened without visible signs of tampering. CAUTION: sticky closure should be adhered in 1 minute. Waterproof Envelopes: Fuxury Padded Bubble Envelopes are laminated to make them completely waterproof and resistant to puncture or tears. When you use a Fuxury Bubble Mailer, the bubble layer provides added cushioning ,outstanding storage and shipping protection to protect the shipment. Guarantee of Satisfaction: All Fuxury products come with our 100% satisfaction guarantee. If you are not satisfied with the product you can return or exchange it. We offer quick shipping. This listing is for a pack of 50 bubble mailers that are a Pink and White in color. You're ready to go into packing mode to make it for the day's shipments; it's definitely tough work preparing bulk shipments. That's why the Ohuhu shipping envelopes mailers boast a self-adhesive quick strip, so you can simply remove the strip and press the bag to close it. And with an extra smooth surface to write a few regards to the recipient on the package itself, label and stamp, you won't find yourself rushing to the stationary store to make up for torn labels and the works. Your blood, sweat and tears (figuratively, of course.) are now left in the hands of USPS. While having the fate of your perfect sellers lie in the hands of a complete stranger may not sound like the best case scenario, you can rest assured that your products are packaged in the hands of a friend. 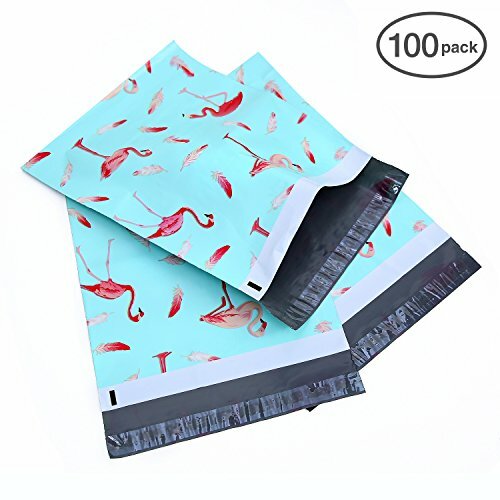 There' s no better way to make your consumers squeal or gifts in delight than to finally have the product in their hands, delivered in a stunning hot flamingo designer envelope bag that screams splendid in a shade. Come to UCGOU! Send your package in clean, simple but grand style which would help to upgrade your company professional image. Believe us. High-efficiency mailers with designer pattern will allow customers to easily identify their orders from your shop when they arrive in their mail. DIMENSION - 6x10 Inches padded envelopes(usable size-6x9"). White outer surface poly film with yellow pineapple designer across the front and back, lined with 80gsm bubble. 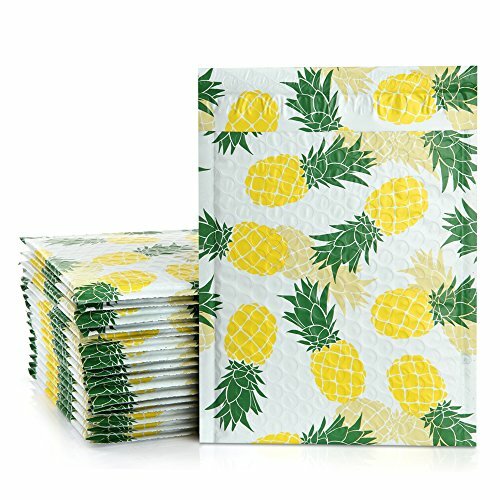 The pineapple designer bubble envelopes would really stand out and make someone smile when they open their mailbox. COST-EFFECTIVE BUBBLE MAILERS - The bubble mailers are lightweight and water-resistant. Lower the shipping cost of your business and protect your products on the rainy or snowy day. And those padded mailers are lightweight mailing envelops, will not add to your shipping costs. TEAR RESISTANCE ENVELOPES - The adhesive on the fold-over flap is strong enough and goes end-to-end. There's no need reinforcement tape and it doesn't come apart unless you tear it up. CUSHION MAILERS - The padding is sufficient to mail small and the items that needed protection. Keep your products safety and make your customer no complaint. The CD/DVD mailers are strong and you could mail small fragile items(within the usable size 6x9). 100% SATISFACTION GUARANTEED - If ther's any reasons you're not completely satisfied with our UCGOU products, just email us and we will reply to you in 24hs for a refund or replacement. Come to UCGOU! Send your package in clean, simple but grand style which would help to upgrade your company professional image. Believe us. High-efficiency mailers would really stand out and make your customers smile when they opened their mailbox. DIMENSION 8.5x12 inch padded envelopes (usale size-8.5x11"), with opaque teal poly film. The bubble envelopes feel nice to the touch and are perfect for labeling and stamping. COST-EFFECTIVE BUBBLE MAILERS The bubble mailers are lightweight and water-resistant. Lower the shipping cost of your business and protect your products on the rainy or snowy day. 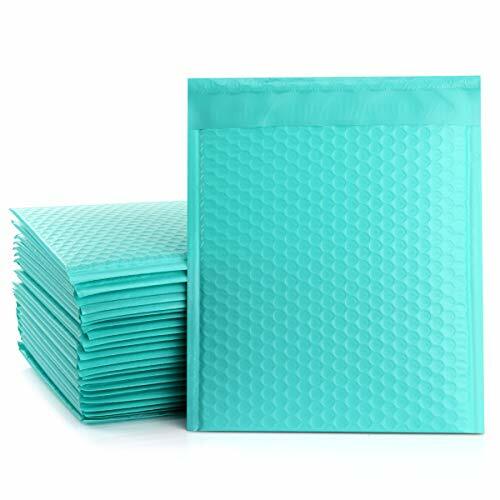 CUSHION MAILERS These are teal bubble envelopes lined with 80gsm bubble. The padding is sufficient to mail the items that needed protection. Keep your product safety. MAIL STUFF The bubble envelopes are strong and you could mail books and other items. The quality of the mailer will hold up them in shipping well. The 13 x 15 reclosable poly bags are perfect to use for packaging or packing merchandise as well. The 13x15 zip bags can be used as garment bags , clothing bags , attire bags , Jackets bags , and sweaters bags . The reclosable clear poly bags have a really reliable zipper. The seal is strong and the lock is secure. 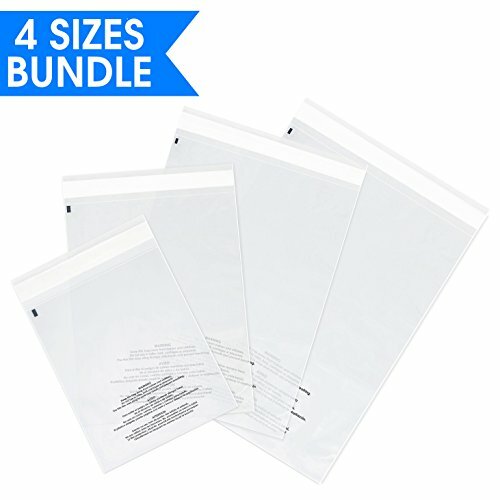 Using these resealable bags not only will save you time but also money! The plastic bag is made of high quality LDPE - it is pliable and incredibly easy to use. SPECIFICATION: 13" Width X 15" Length (Length excludes the zipper ). 2.0 Mil Thickness. 100 Units of the Clear Reclosable Poly Bags with the Zip to Seal feature. Our Sealable zippers are incredibly easy to self seal and yet, are super secure. WIDE RANGE OF USES: Great for a variety of usages such as storage, organization, shipping and packaging. Our 13X15 resealable zip bags are perfect as apparel bags and for packaging clothes, sweaters, jackets, and other large clothing. The reclosable zip bags are made with premium-grade, virgin LDPE plastic, which means that our clear plastic bags are durable and able to withstand the unpredictable shipping process. WATERPROOF AND AIRTIGHT: Quality you can see and feel - our zip bags are completely airtight and waterproof. Designed to keep moisture out and to be leak-proof, the 13 X 15 poly bags are perfect for brochures and flyers. Our reclosable bags eliminate the need for impulse sealers or tape, and are significantly more reliable than resealable cellophane cello bags, flap lock poly bags and regular flat poly bags. WILL IT FIT? : In addition to the Width & Length, you will also need to measure your product's Height (Thickness) because the polybag will need to fit around your whole item. Required Bag Width = Item Width + Item Height + 1. Required Bag Length = Item Length + Item Height + 1. Example: If the product is 11 X 9 X 3, the required polybag size is 13 X 15 (Width X Length). Required Width (13) = 9 + 3 + 1. Required Length (15) = 11 + 3 + 1. 2x3, 4Mil clear reclosable zip lock plastic bags are a great way to package your product in a safe and easy way. Each bag features a prime quality zip that will protect its contents. The 4Mil heavy duty plastic which is like a freezer bag thickness provides additional protection over the standard zip lock bags. These small zipper baggies are perfect for packaging, jewelry, beads, findings, gems, precious stones, and more. Top quality 4 Mil reclosable zip lock bag has a high quality zip that protects your product. These small bags are great for packaging jewelry, beads, coins etc. The 9 X 12 reclosable poly bags are perfect to use for packaging or packing merchandise as well. The 9x12 zip bags can be used as garment bags , clothing bags , attire bags , tshirt bags , and t shirt bags . The reclosable clear poly bags have a really reliable zipper. The seal is strong and the lock is secure. Using these resealable bags not only will save you time but also money! The plastic bag is made of high quality LDPE - it is pliable and incredibly easy to use. SPECIFICATION: 9" Width X 12" Length (Length excludes the zipper ). 2.0 Mil Thickness. 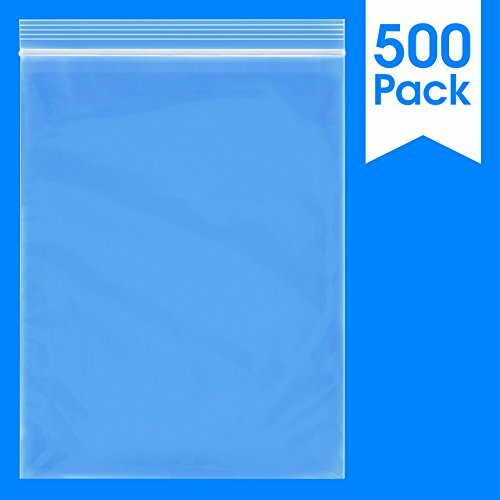 500 Units of the Clear Reclosable Poly Bags with the Zip to Seal feature. Our Sealable zippers are incredibly easy to self seal and yet, are super secure. WIDE RANGE OF USES: Great for a variety of usages such as storage, organization, shipping and packaging. Our 9X12 resealable zip bags are perfect as t-shirt bags and for packaging clothes, tshirt, and other small clothing. The reclosable zip bags are made with premium-grade, virgin LDPE plastic, which means that our clear plastic bags are durable and able to withstand the unpredictable shipping process. WATERPROOF AND AIRTIGHT: Quality you can see and feel - our zip bags are completely airtight and waterproof. Designed to keep moisture out and to be leak-proof, the 9 X 12 poly bags are perfect for documents and catalogs. Our reclosable bags eliminate the need for impulse sealers or tape, and are significantly more reliable than resealable cellophane cello bags, flap lock poly bags and regular flat poly bags. WILL IT FIT? : In addition to the Width & Length, you will also need to measure your product's Height (Thickness) because the polybag will need to fit around your whole item. Required Bag Width = Item Width + Item Height + 1. Required Bag Length = Item Length + Item Height + 1. Example: If the product is 8 X 5 X 3, the required polybag size is 9 X 12 (Width X Length). Required Width (9) = 5 + 3 + 1. Required Length (12) = 8 + 3 + 1. Unsurpassed Water & Tear Resistance. Light Weight & Time Saving. 100% recyclable. 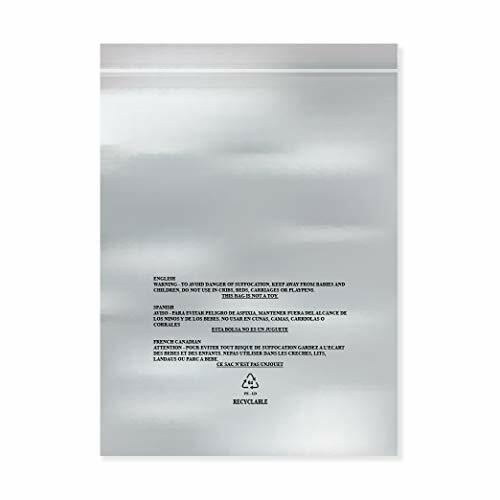 Our 6 X 9, 8 X 10, 9 X 12, 11 X 14 clear Suffocation Warning poly Bags has the Suffocation Warning printed directly on the bag. Our durable, clear plastic bags are used as bags, packaging, mail, and shipping bags, and perfect for Amazon FBA. The glue is permanent and not resealable - this is perfect for packing products that you want to have the best protection. Our self-seal 6X9 poly bags eliminates the needs for Suffocation Warning stickers and labels , impulse sealers , and are significantly more protective and faster to seal than Reclosable zip bags , Cello & Cellophane Bags , Flap lock poly bags or regular flat polybags. The 6X9 Clear plastic bag with self adhesive is compliant with Amazon FBA and perfect packaging bags. The LDPE material makes the mailer bags pliable and able to get stretched. The clear poly bags has the suffocation warning printed on the FRONT of the bag. SPECIFICATIONS: 6" X 9", 8" X 10", 9" X 12", 11" X 14" (Length excludes the Glue Flap). 1.5 Mil Thickness. 100 Units of Each Size - 400 Units Total of the Clear Poly Bags with Permanent Self-Seal Adhesive and printed Suffocation Warning. The self sealing bags use a powerful glue, that is tamper evident, reliable, and not resealable. Once sealed, the clear plastic bag cannot be opened without visible damage to the mailer bag. PERFECT FOR FBA & SHIPPING: Completely compliant with Amazon FBA, our poly bags are perfect for packing and mailing merchandise. Our 6 X 9 , 8 X 10 , 9 X 12 , 11 X 14 plastic bags are perfect to use everyday in the warehouse for all packaging and shipping purposes. Our 6X9 , 8X10 , 9X12 , 11X14 suffocation warning bags are made with premium-grade, virgin LDPE plastic, which means that our poly bags are durable and able to withstand the unpredictable shipping process. SAVES TIME: Not only are the clear bags sealable with our easy self-seal feature, but they are also printed with the FBA required suffocation warning. Our permanent self seal 6X9 , 8X10 , 9X12 , 11X14 poly bags eliminates the need for suffocation warning stickers and labels, impulse sealers, and are significantly more protective than reclosable zip bags, resealable cellophane cello bags, and regular flat poly bags. WILL IT FIT? : In addition to the Width & Length, you will also need to measure your product's Height (Thickness) because the polybag will need to fit around your whole item. Required Bag Width = Item Width + Item Height + 1. Required Bag Length = Item Length + Item Height + 1. Example: If the product is 6 X 3 X 2 (L X W X H), the required shipping bag size is 6 X 9 (Width X Length). Required Width (6) = 3 + 2 + 1. Required Length (9) = 6 + 2 + 1. Note:If you have any question, please feel free to contact us in time and we will provide you with good resolutions within 24 hours. Mighty Gadget brand suffocation warning nags are the lightest, most cost-effective poly bag available. From clothing and jewelry, to sensitive legal documents, these versatile poly bags will get your package safely to its destination. No more licking. No more paper-cuts on your tongue. No watery mess to clean up after trying to moisten your bag closure strips.With these regulation compliant envelope bags, no additional steps needed! Each individual bag is printed with the necessary Choke/Suffocation Warning directly on the bag so no additional warning labels need to be purchased or made. Perfect for apparel, Amazon FBA items, T-shirts, blankets, office products, scarves, or other accessories etc. They make great bundle bags for private labeling or retail arbitrage. The bags are see-through and perfect for scanning barcodes that are inside. The plastic poly bags have a 1.5 folding flap with a strong self-seal. Easily and securely close these storage bags using the quick peel and seal adhesive strips that ensure your products are safe. The bags are flexible & lightweight in order to save you from added shipping costs! Items easily slip into poly bag with 2 vent holes which allow air to escape. 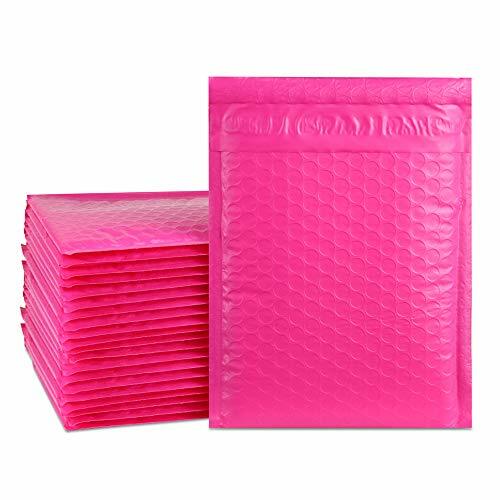 High quality pink poly mailers. Made from recycled material, switch to our brand i promise no disappointments in price, service and quality. 6x10" #0 Pink Poly Bubble Mailers 50ct. 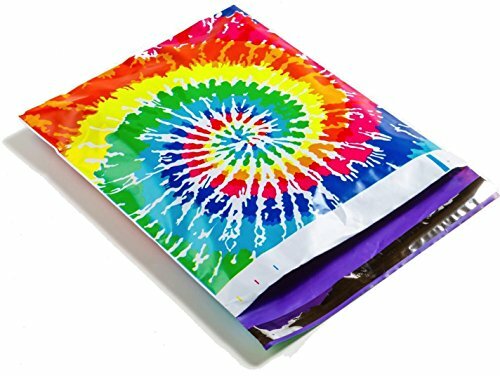 Poly bubble mailers are unique, lightweight padded mailers made from a durable, moisture resistant, multi-layer blend of polyethylene film. The self-seal closure provides a reliable, tamper-evident seal to secure all enclosures. While being opaque, the exterior film creates a crisp, professional image for your company. Storage can become a mess, rooms get mixed up, you don't remember where you had certain things stored, and nothing is where you initially placed it in the box. To prevent that conflict, an easy solution is to use resealable zipper bags. Easily organize all of your belongings in whichever categories you need them to be. Pack your jewelry together or your hobby materials or even your kitchen supplies. Don't let your storage get messy and make a trouble for yourself later. Organize now and you'll have no fuss when you need to search for it. Resealable 9" x 12", 4 mil. bags Count of 100, 500, 1000. 4 mil thickness, resistant to most breakage. Ships in convenient packs of 100. Store multiple products, such as jewelry, hobby materials, spices and herbs, nails and small tools, office materials, and much more. Protect your items from damage caused by moisture and dust. Moistureproof, resealable, matte surface, no smell, with tear notches on both sides which makes easy and convenient to tear the bags. 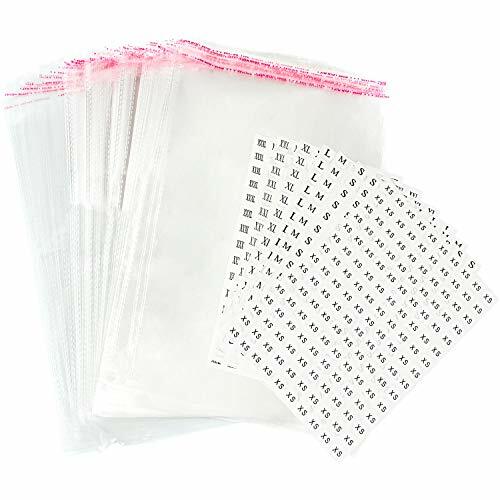 Can be heat sealable, for extending storage time, you can use a heat sealer to seal these bags above the zipper closure. The ziplock bags are reusable and reclosable. Made of durable, thick, non-toxic, food grade material. To extend the shelf-life, retain freshness, keep away from harmful elements, such as water, moisture, vapor, odor, and blot. Application: Food, Coffee, Candy, Tea, Dried Fruits, Nuts, Seeds, Cookie, Dried Flowers, Snack, Powder, Herbs, Spices, Jewelry, Electronic Products, Electronic & Hardware Accessories, etc. Size may vary by about 2-3mm. Color of product in hand may vary from pictures due to slight manufacturing difference and monitor settings. If you'd like to purchase in bulk, please contact us through Amazon messages! MATTE FINISH, FROSTED TRANSPARENT - the matte surface makes these bags high-end and elegant which are suitable for you to display your products at store or home. RESEALABLE & REUSABLE - ziplock closure allows the bags to open and close easily and can be used over and over again. HEAT SEALABLE - prolong the shelf-life of your products by heat sealing after filling. We recommend impulse heat sealer. MULTIPURPOSE - perfect for food related products, jewelry, crafts, electronic products, electronic accessories, hardware accessories, etc. DURABLE MATERIAL - made of non-toxic, odorless & durable material of thickness 3.9Mil (10C) / Side.